The Triple J Manor House is a breathtaking 6,000 square-foot venue located in Davie County. The home was originally built in the 1900s for Benjamin F. Holton. This typical two-story three-bay farmhouse featured a hip roof front porch, gable and chimneys, and a rear ell with an enclosed porch. 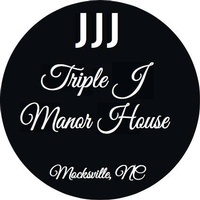 The Triple J Manor House is one of the Triad’s newest venues at a very affordable rate. We offer a list of experienced caterers and vendors, but you may use your own. The grounds are beautifully landscaped for outside events. We offer Wi-Fi and do have the technology for music and videos. Only thirty minutes from Winston Salem, forty-five minutes from Greensboro, and one hour from Charlotte, Triple J Manor House is the perfect location for any event. Construction on the house began in April of 2016 and will be completed in the fall of 2016. Triple J Manor House’s extraordinary venue will compliment the event of your dreams.